Sisters of the Sea, bronze statue, by Erik Christianson. 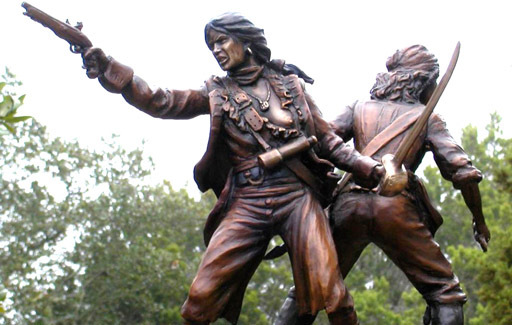 The Caribbean Seas never witnessed two more daring and lethal women as Anne Bonny and Mary Read. Freedom, adventure, and equality lured these ladies into a pirate's life. After many years of living on the seas disguised as men, they eventually partnered with the infamous Calico Jack Rackham. In the summer and early fall of 1720, they terrorized, marauded, and plundered nearly a dozen merchant ships. One fall evening that year, a vessel captained by the bounty hunter, Jonathan Barnett, ordered the pirates to surrender. Badly outnumbered and quite a bit drunk, the crew gave little resistance. Many of whom hold up below deck. However, Anne and Mary refused to give up, firing their weapons and swinging their cutlasses. Mary, disgusted by her helpless crew, yelled, "If there's a man among ye, ye'll come up and fight like the man ye are to be!" No one responded, so she fired a shot into the hold, killing one dead. Jonathan Barnett's crew quickly overpowered Anne, Mary and Jack Rackam's entire ship. The gallows and noose awaited. Only the legal defense of "pleading the belly" (pregnancy) spared the women -- no such fortune for Calico Jack.